Government Office. Thanks to all of you, we celebrated our 88th anniversary this year. We often get asked “This place is far from the orgin hot spring, isn't it? ” . Ryokan Marui was founded by the landlady's father in 1927 . In the beginning Ryokan Marui was a small inn, but since then we have grown in to what we are today. As the times change, our hot spring baths now are made of cypress wood. Our food uses natural and carefully selected ingredients. 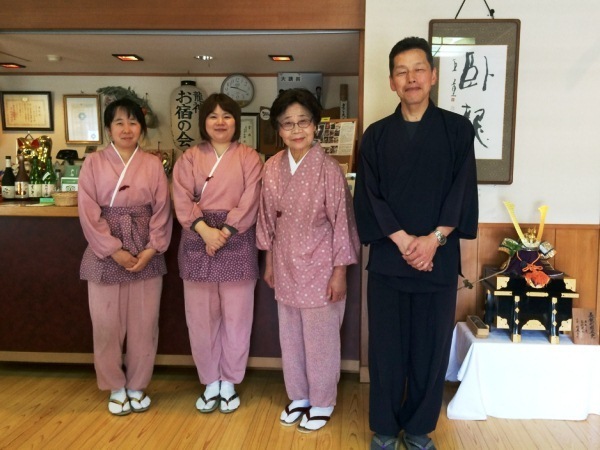 Our motto is“ Magokoro Yado (Ryokan Marui of Sincerity), Homemade cuisine, Hospitality” . Our landlady, chefs, and all our staff do their best to make everyone of you have a relaxing and refreshing time during your stay. All of our staff is looking forward to your visit.